Last week on Instagram, I posted a gorgeous ivy-covered home posing the question, “Has anyone ever lived in an ivy-covered home? I hear the ivy is damaging and would love to learn more.” The post generated over 6,000 likes and 135 comments! It seems most everyone loves the romance of these charming homes… but they can be high-maintenance. After reading all the comments, I thought it would be fun to summarize them here today and share a plethora of additional ivy-covered eye candy. Source unknown. One Instagram reader commented that this home is down the street from her home in Boston. Comments regarding problems with ivy included damage to bricks and to mortar between the bricks, as well as ivy finding its way into screens, cracks in windows, and spaces between wood siding. Apparently it can hold moisture against the house causing mortar to crumble. One person had to replace the mortar between the brick. Ivy can also adhere to stucco causing stucco to pull away from the house. Some comments suggested there was less of a problem in dry climates vs. damp, high humidity climates. However, others indicated that they had not had these issues. A 1920s Dallas home, via Architectural Digest. There were two things that were apparent in these comments. One: Ivy has to be maintained, i.e., trimmed at least a couple of times a year, kept away from screens and windows, and kept away from creeping into vents, etc. Two: One should choose the best type of ivy… Apparently some types of ivy are more damaging than others. English Ivy, Boston Ivy, Fig Ivy, and Virginia Creeper were suggested as less damaging alternatives. A 1930s David Adler home in Lake Forest, Illinois. Source. Another problem mentioned with ivy was the critters that it can attract. Rodents, spiders, birds and their nests, and bugs and insects in general are a few examples. One person described how a snake had crawled up the ivy onto the roof and into a vent going into the house. It got under the bed in a guest bedroom and caused quite a stir. Another said her ivy was used by squirrels as a super highway to the roof of their house where they caused damage. They cut the ivy back several feet from the roof and solved the problem. One person said that her ivy had become a breeding ground for big cockroaches. The Oaks estate in Cohasset, Massachusetts, once owned by the heirs to the Dow Jones and Wall Street Journal fortunes. Source. A French chateau in La Chapelle-sur-Dun. A popular alternative, Virginia Creeper, can grow in sun to full shade, where soils are soggy to dry and even in lightly alkaline soils. The adaptability of the plant makes it suited for any site but care should be taken to keep it off wood siding and gutters. The vine climbs and adheres to vertical surfaces with aerial roots, and the weight of the plant could pull off boards and misalign gutters. Grosse Pointe Farms, Michigan. Source. Additional information on Creeping Fig can be read here, and visit here for more on English Ivy. These are two more alternatives that were mentioned. Another recommended alternative is Fig Vine. But some warn of the damage they can cause as well. A 1910 Georgian in Marblehead, Massachusetts. Source. Hilfiger estate on Nantucket. Source. An Italian country manor. Source. Dallas, Texas (Highland Park). Source. A River Oaks estate in Houston, Texas. Source. Tulip Hill in Maryland, circa 18th century. Source. A circa 1927 Greenwich, Connecticut real estate listing. Source. Hidden Pond Farm, Morris County, New Jersey. Source. Circa 1915 Rye, New York real estate listing. Source. Circa 1920 Nashville, Tennessee real estate listing. Source. Ralph Lauren’s circa 1919 Bedford, New York estate. Source. Sister Parish’s childhood home. Source. A 17th century Hampshire vicarage, England. Source. Atlanta, Georgia (Druid Hills). Source. Climbing roses, also worth considering. Chesapeake Bay. Source. There seems to be mixed reports on all suggested alternatives. I think the bottom line on all ivy type plants, even the alternatives, is that they can cause some damage, especially if they are not kept in check. But they are so beautiful that they are worth it! To see my Instagram post on the subject and all 135+ comments, please click here. I’d love your thoughts, please weigh in! I’d always wondered! Thank you for this post! What an interesting post- we could probably write a whole book on the subject! I love the Raleigh house and the one with the climbing roses- the idea of ivy on brick makes me recall the heavenly fragrance of old boxwood- which is very refreshing and even a bit intoxicating! I grew up always hearing about people who were having to have their brick “re-pointed” – and every other house in Charlotte and Winston-Salem has painted brick, which I really like. In fact, some of my favorite old houses have peeling painted brick, mixed with ivy or creeper- the look of age is very romantic and charming! Did you know that the iconic Los Angeles decorator, Rose Tarlow, has had vines growing inside her living room (from the outside) for years? And she got the idea from famous San Francisco decorator, Michael Taylor, whose house in the Sea Cliff section also had the same vines coming in across the ceiling beams from the via the windows! You can see this in the book, Michael Taylor Interior Design, by my dear friend Stephen Salny, who btw, attended Lake Forest College. The whole idea of vine covered houses has been huge in West LA for many decades- and that’s one reason why the Brentwood and other west LA neighborhoods are so charming and so desirable. When I finally get to build my small dream house, I can assure you that there will be climbing roses, creeper, coquina stone, and pea gravel! Not to mention old, reclaimed architectural elements such as doors and beams! Call it Santa Barbara in Naples! Thanks for this beautiful post, it was a lovely way to begin my day! Yes great photos Who doesn’t love the look of ivy covered houses.? It looks nice on brick. I had a climbing hydrangea that over took one side of my house. It was gorgeous. Then it was time to paint and plant was cut back to ground and I cried. But strong be the roots and a couple years later it’s Back! When it covered a window I cut around the opening. I am going to do some research and find what grows in semi shade at my new residence your blog is the best. Hi! The bottom line on ivy I haven’t seen written yet. Deciduous. Deciduous vines when kept out of vents, etc., do not damage stucco or brick. 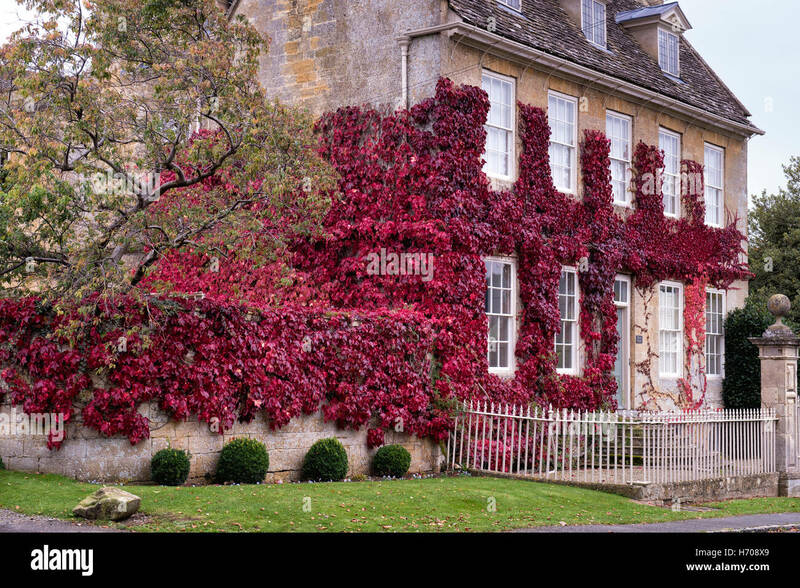 My house is completely covered with Boston Ivy. I have seen serious damage by creeping fig and english ivy. One stone house had creeping fig a foot deep; and it needed new mortar. Another big plus with deciduous ivy is the lovely fall colors it displays, as well as the fresh spring green! In Santa Barbara, we pretend we have seasons with our ivy! I’m in the minority I guess given ivy covered homes has never appealed to me. To me it detracts from the house’s architecture. Interesting write up though. After reading the part about bugs, insects, spiders and heaven forbid snakes…well that would do it for me even if I did like the look haha. Virginia Creeper is a voracious grower–and the devil to get rid of. The small green ball-like fruits/flowers are highly toxic to children. I live in Virginia and our homeowners insurance carrier will not insure a home that has any type of ivy/vine growth. We had to take it off of the house we bought before the policy could become effective. Our family home has deciduous vine growing on it too. We maintain it regularly and wouldn’t trade it. I have photos on my lifestyle board on Pintrest. Love all the beautiful pictures you shared here. Thank you for a wonderful and informative post! fully extricate the plants away from the shingled house…And I won’t go into the raccoon problem – I basically gave them a ladder. I love the looks of houses covered with ivy. I didn’t know all these disadvantages. But these houses looks so cool. I’m torn. Thanks for sharing Andrea! Such a beautiful pictures you have shared. Really amazing I love nature and want to surround near the greenery. I love the Houston, Texas which is amazing one. I also had always adored the look and allure of ivy covered houses……..
that was before I took a Real Estate class given by a professional building inspector and engineer who described what he encountered when he went to inspect the attic of a gorgeous two story ivy covered home that would make most swoon. He entered the attic and immediately noticed that it was COVERED with shedded SNAKE SKINS!!!!! He explained that the perfectly manicured ivy which was covering this gorgeous home was a snakes’ natural habitat and became an easy and quick pathway up the house into any opening they could squeeze through to a cozy and quiet attic home for them many, many years from the number of skins he encountered. He also knew that many of them were still alive and hiding amongst the rafters!!!! Can you imagine that!!!! OMG!! When he went downstairs and reported this to the homeowners, they said they had loved their house for 25 years and this was an unimaginable shock. That night, the wife said she couldn’t live in that house for another night ….and she didn’t! Needless to say, I have never looked at ivy covered homes the same dreamy way again. I bet no one sitting in that class ever have either. What a beautiful post. In college, a couple of girlfriends and I rented an old two-story home covered in ivy (maybe, Virginia Creeper?). The home had not been updated and still had the original single-paned windows. In addition to making the home extremely difficult to heat, the old windows allowed colonies of ants to climb up the ivy and into our second story windows. Definitely a nuisance, but like many others, I thought it looked charming. With an updated, well sealed home, ivy could make a lovely feature. Thanks for the article.